The Giants have beaten the Redskins five straight times, and will look for six straight tonight as week four of the NFL season kicks off with a Thursday night game at Met Life Stadium between the two NFC East foes. The Redskins are coming off an impressive win at home over the Rams in which they ran all over St.Louis, a team that the week before had beaten the NFC Champion Seahawks at home. Last week the Skins finished with 182 yards on the ground in the 24-10 win, with rookie Matt Jones gaining 123 yards. The first week in a 17-10 loss to the Dolphins, running back Alfred Morris ran for 121 yards. The Redskins are the first team since the 2006 Chargers to have two backs each gain at least 100 yards on the ground in a season’s first two games. It will be a battle of wills on Thursday night, as the Giants have been solid against the run in their first two games, allowing just 68 yards per game, third in the NFL. The problem with the Giants and why they enter Thursday at 0-2 is the fact they have had two 10-point leads in each of their first two games, only to go on and lose. They were up 20-10 on the Falcons at home a week ago, and lost 24-20 when Atlanta scored in the last minute for the win. Eli Manning has been average at best, throwing for just 485 yards, two touchdowns and no interceptions. “We’re not making the plays in the crucial moments, we’re having penalties and mistakes at different times that are preventing us from being as good as we can be,” Manning said. 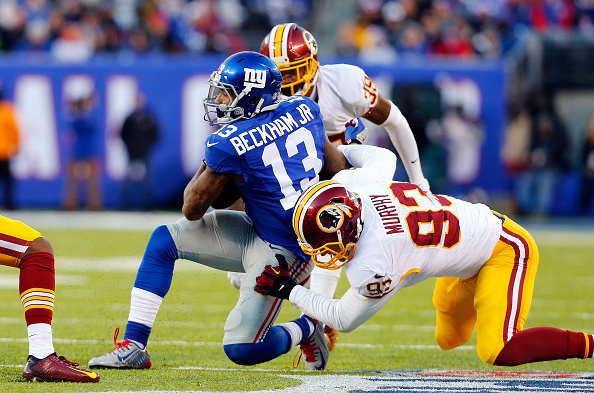 Odell Beckham Jr. had seven catches for 146 yards and his first touchdown on Sunday. He had 12 receptions for 143 yards and his first three-touchdown game the last time these teams met, a 24-13 victory for New York on Dec. 14. The Giants are 4-0 against the Redskins since 2013 and 9-21 against everyone else. Thursday it will be 0-3 for the Giants, as the Redskins with their reborn run game will be able to do a lot better than the 68 yards the Giants have given up the first two games. Also Eli has been prone to mistakes when the game is on the line, and if the Skins can get a lead, he will start to force balls in, which means another long night for Giants fans. Look for the surprising Skins to get to 2-1, finally getting a win over their rivals.